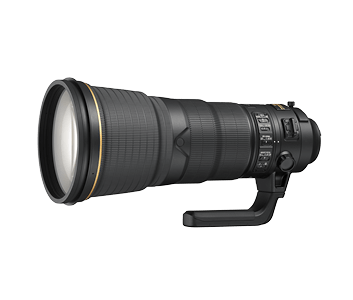 The AF-S NIKKOR 400mm f2.8E FL ED VR is a superior 400mm super-telephoto lens that captures incredibly crisp images even from the maximum aperture, and is the perfect combination of impressive optical performance and amazing portability. With design innovations and new features such as the Vibration Reduction (VR) SPORT mode, the AF-S NIKKOR 400mm f2.8E FL ED VR gives you nothing short of clear, beautiful images. Adopting a unique electromagnetic diaphragm mechanism, the AF-S NIKKOR 400mm f2.8E FL ED VR provides stable exposure control even during high-speed continuous shooting. It is FX-format compatible and features improved optical performance, autofocus (AF) speed, AF accuracy, and auto exposure (AE) accuracy, making it the professionals choice for sport photography. The AF-S NIKKOR 400mm f2.8E FL ED VR is indispensible, especially in situations where subjects are continually moving quickly. The new Vibration Reduction (VR) SPORT mode compensates for the image blur caused by camera shake, which is especially effective when shooting sporting events. The variation of image finder for each frame has also been removed, ensuring natural and comfortable viewing in continuous shooting. Shoot images of the highest standards thanks to the fluorite and ED glass elements that ensure minimal chromatic aberration, along with a Nano Crystal Coat that reduces ghosting and flare. Featuring fluorite coating and magnesium alloy in the lens barrel, the AF-S NIKKOR 400mm f2.8E FL ED VR is light in weight and durable.